Ok, I’ve been going nuts with these, but the prices on the Carl Martins have been retarded-cheap, and are flying off the shelf. Looks like there are only three pedals models left with the killer savings. I’ll list them below. 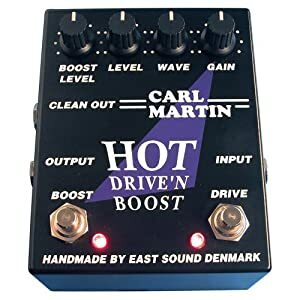 Carl Martin Hot Drive’n Boost has been carefully designed to imitate the sound of a good old-fashioned distorting Tube-Amp. The Hot Drive’n Boost is the perfect choice for that crunchy blues tone, with plenty left over for a great hard rock tone as well. With the BOOST feature the Hot Drive’n Boost is a “TWO IN ONE” pedal. That allows you to get that extra “kick” (up to 20db) for solos to really stand out. The Hot Drive’n Boost has a built in regulated (+-12V) power supply. This enables us to design circuitry of the highest quality with maximum headroom. The low output impedance insures a lo noise connection, and gives improved working conditions for the guitar amp. 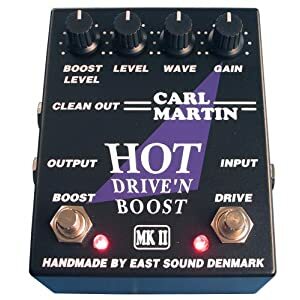 Carl Martin Hot Drive’n Boost MKII has been carefully designed to imitate the sound of a good old-fashioned distorting Tube-Amp. It is similar to the Hot Drive’n Boost but has a rougher and deeper sound. With the BOOST feature the Hot Drive’n Boost MKII is a “TWO In ONE” pedal. That allows you to get that extra “kick” (up to 20db) for solos to really stand out. The Hot Drive’n Boost MKII has a built in regulated (+-12V) power supply. This enables us to design circuitry of the highest quality with maximum headroom. The low output impedance insures a lo noise connection, and gives improved working conditions for the guitar amp. 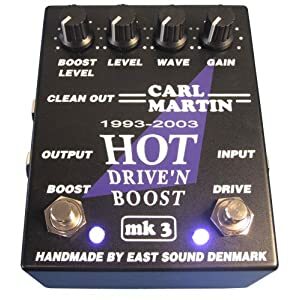 The anniversary Hot Drive’n Boost MK3, featuring a complete new overdrive design that gives a even more authentic “tube” simulating overdrive than the original HDB, which is know to be one of the best. The new HDB MK3 sound like a tweaked up quality tube amp, and on contrary nearly every other overdrive pedal does it not change the original tone, has no midrange pronouncement, no low end cut of, no high end cut of, all that gives a tone of a clear brilliant tube drive of it’s own. FEATURING: Built in mains power supply. Two in on functions (overdrive & boost). Blue high bright LED. With the BOOST feature the Hot Drive’n Boost MK3 is a “TWO IN ONE” pedal. That allows you to get that extra “kick” (up to 20db) for solos to really stand out. The Hot Drive’n Boost MK3 has a built in regulated (+-12V) power supply. This enables us to design circuitry of the highest quality with maximum headroom. The low output impedance insures a lo noise connection, and gives improved working conditions for the guitar amp. Which, if any, do you own? If so, how do you like?